The greatest tall sails adventure stories surround the compelling beauty of the tall ships themselves. Each one has it's own character, and tales of adventure. Dangerous challenges as well as fun events are experienced from the decks of the tall ships as their bows break through the mighty waves at sea. Their sails captivate the heart as they gracefully, yet forcibly capture the wind to obey their every command. Every tall ship holds it's own mysteries, but few are privileged to these sailing adventures upon the high seas. The Barque Picton Castle in Nova Scotia may sound like a stone fortress, but indeed she is a wonderful tall sailing ship as you can see! 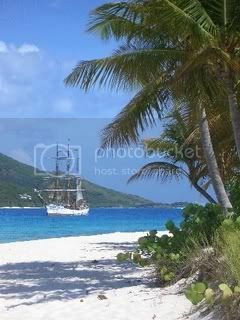 Built in 1928, the Barque Picton Castle is owned and operated by the Windward Isles Sailing Ship Company, Ltd. 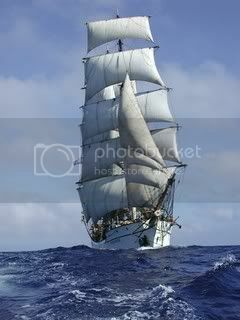 The ship's mission is deep-ocean sail training and long-distance education. She also carries supplies and educational materials to islands in the South Pacific. She is 179 feet overall, and carries 12,450 square feet of canvas sail. There is much to learn about this wonderful ship, inluding her role during World War II in the Royal Navy. It's time to get your sea worthy legs in position as you take a tall sails adventure to read more about the Barque Picton Castle and her crew. Behind the helm of every good ship is a crew (Eric pictured above), and of course the Captain. 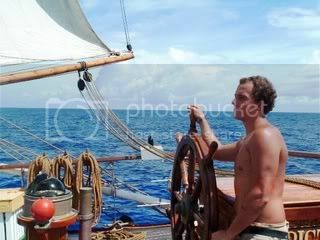 Captain Daniel Moreland is one of the most respected sailing ship masters at sea today, and he has sailed the world. You may find it interesting to learn about their Captain's recommended reading list, as it is a must have. We have provided his reading list for you below. Before we depart to sail back to reality, we must first provide a word of thanks! 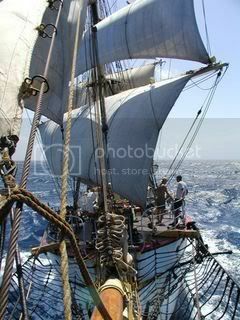 Thank you Barque Picton Castle for granting us permission to present your ship's information and photos to our readers. Special thanks too to David their Voyage Coordinator for assisting us in obtaining that permission.